Some readers may be aware from Yvonne's Lip-Sticking posts that we're in NYC blogging from the Fortune Innovation Forum this week (now all of you are). This first post comes to you LIVE (sort of) FROM NEW YORK -- actually, that just means I'm typing on the laptop at a table in the "play" area. So I'm going to give you just a few quick takes on the action from this morning. 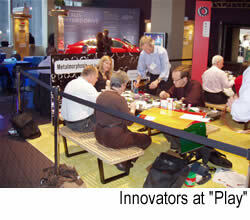 The first session this morning featured Andy Stefanovich, of the creativity and innovation consultancy Play. Andy's title is "In Charge of What's Next" ... and his company set up a "play area" in which he urged us stop in and, well ... play. His advice for becoming more innovative included encouraging "slightly disruptive" thinking, being "confusion tolerant" during early thinking about solutions to problems, being ready to embrace the "unexpected in-betweens" in the process, and being both "interested and interesting." In the next session, we listened to Gary Hamel predict the future of management, starting from his thesis that management itself is the next great opportunity for creating large returns on the investment. He gave examples and spoke of a "post-management" business world, with flat organizations (including flat compensation models), in which the consumer wields the power. I took three and a half pages of notes and cannot begin to do justice to this session here, but hope to find time to give it better treatment in a full post or two. Suffice it to say here that every session I've been in since and most of the hallway conversations I've been in or overheard have mentioned one thing or another from Gary's talk as a starting point or context for the discussions. I'll close for now with a quick mention of the workshop session I attended on "Using Images to Think, Innovate and Drive Business," by Tom Wujec with Autodesk -- another session I can't do justice to here. In a former life (2003) I wrote some posts extolling the virtues of the wall-sized computer screens shown the the Tom Cruise movie "Minority Report" as a tool for knowledge work. Tom's company has made that vision a reality, building Visualization Studios in which teams can work with floor to ceiling digital corkboards to see, rearrange, and connect the information they need to solve problems. 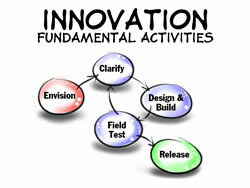 He described ways this kind of technology can support and drive rapid, re-iterative innovation cycles. The title of this post refers to one of Tom's examples: he conducts creativity sessions for various groups in which small teams are given some dry spaghetti, tape, string, and a marshmallow. In 15 minutes, they are supposed to design and build a strucure to support the marshmallow. The tallest successful assembly wins. He asked us which group generally does the worst at this challenge? His answer: recent B-school grads. Which groups do best? You guessed it: the E-schoolers (elementary school kids)! His explanation: the kids aren't wasting any time or energy jockeying to become the CEO of their marshmallow enterprise. With that humbling thought ... more to come! PC Magazine's January 2005 issue (not online, oddly) selects as "People of the Year" the founders of Blogger and our own favorites Mena and Ben Trott of Six Apart, who gave us both Movable Type and TypePad. Ben posts regularly to the blog that is Six Apart's Web site. Mena has her own business blog, Mena's Corner. Mena's current lead post hits close to home for us, as it discusses both her speech to the GraceNet women's organization and her helping author Mary Trigiani build a blog to support her book. The blog is called Mary Trigiani, in her own voice; the book is Cooking with My Sisters : One Hundred Years of Family Recipes, from Bari to Big Stone Gap. It's great to see others using blogs to support and supplement their print publications, as Yvonne has done with Lip-Sticking. 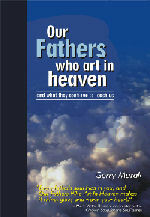 We've been sharing that idea with authors, too, like Gerry Murak, who's using his blog to help gather submissions for his wonderful forthcoming collection, Our Fathers Who Art in Heaven. So, we're all for recognizing the pioneers who gave us the tools. But we think PC Magazine is a couple of years behind in doing so and that this year's focus should be on the bloggers themselves, as several others have suggested (for links see Yvonne's post here). Why not designate bloggers as the collective People of the Year? To badger Time Magazine, e-mail them here.